Larus argentatus sensu lato 3P72 adult, May 2014 & April 2015, Zastów Karczmiski, Poland. Picture: Łukasz Bednarz ringing team. Location: Zastów Karczmiski, Poland - colony at the banks of the Middle Vistula river. 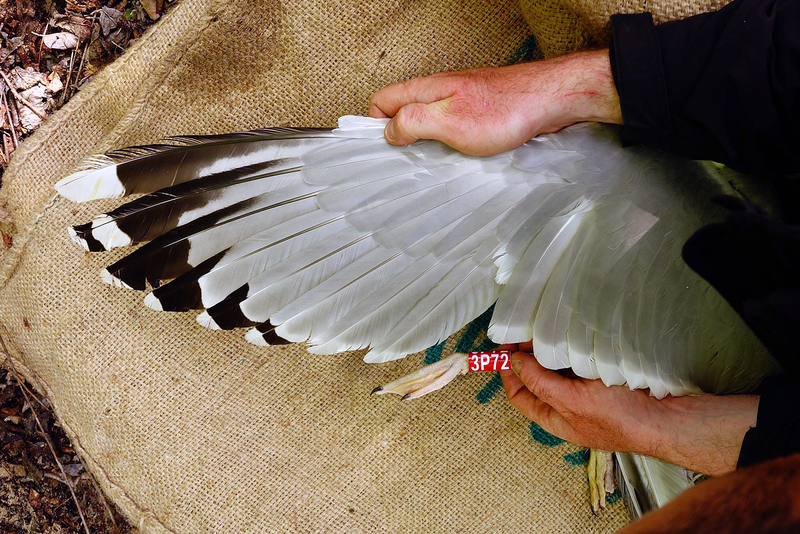 In 2004 240 breeding pairs (95% cachinnans, <5% argentatus). (Ornis Fennica 2011 88, 80-89) and in 2012 592 pairs (90% cachinnans, <10% hybrid / argentatus) and possibly Larus michahellis (pers comm. Łukasz Bednarz). Middle Vistule river is a location where several taxa breed: see composition. 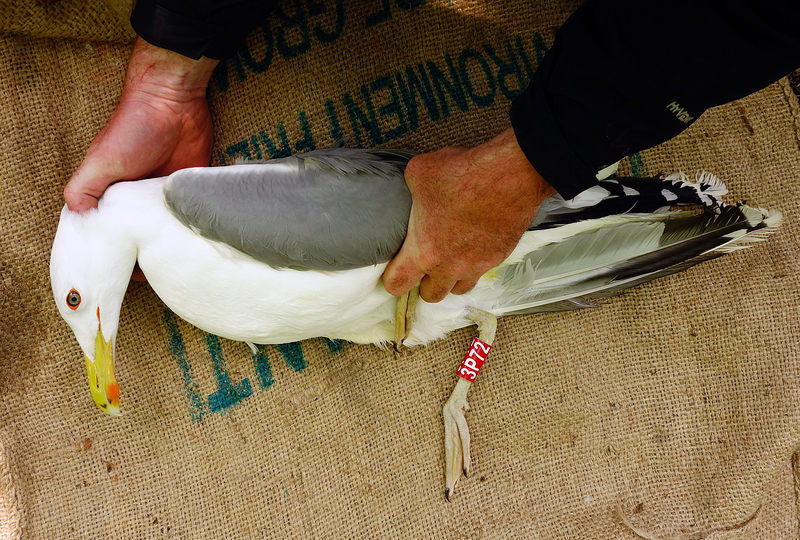 Since this is a mixed breeding population where hybridisation is not uncommon, the ringing centre in Poland decided to label birds "Larus argentatus sensu lato". Still bulk of the breeding birds in Middle Vistula region show features of cachinnans. below: Larus argentatus sensu lato 3P72 adult, April 20 2015, Zastów Karczmiski, Poland. Picture: Łukasz Bednarz ringing team. Probably cachinnans male, but from this angle, bird with huge gonys angle reminiscent of argentatus. below: Larus argentatus sensu lato 3P72 adult, May 02 2014, Zastów Karczmiski, Poland. Picture: Łukasz Bednarz ringing team. Breeding bird trapped at the nest. 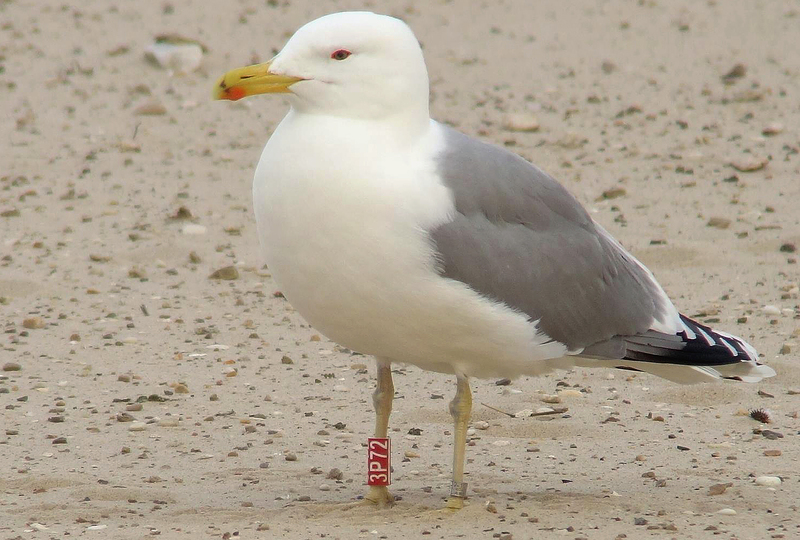 Adult with powerful bill and relatively broad medial band. Little speckling in the otherwise clouded iris. Orange-red orbital ring and gape. No red on upper mandible; obvious black on the upper and on lower mandible. Pale yellow legs. Medium pale tongue on P10, broad band on P5; no black spot on P4. P1-P2 dropped, PMS=2.